Congratulations to everyone who has completed all ten tasks! Your digital badge is guaranteed and will be with you shortly (see below). Don’t worry if you haven’t completed all the daily tasks yet – there’s still time! All tasks must be completed by 5pm on Friday 29th March. This allows an additional two weeks for those of you who were unable to finish the course while it ran. If you do not receive a Digital Badge but think you are entitled to one, please contact Mark Warnes. Yes, I know this is 10 Days of Twitter, but I thought it would be useful to offer some suggestions about how you can continue to use Twitter in an academic context. An intriguing question is whether or not anything academically meaningful can be conveyed in 280 characters, when most academic publications are thousands of words long. These can be journal articles, blogs, website updates, etc. It is a good idea to have access to an online version of the full publication, or to an abstract, so that the tweet can point somewhere for followers to get more information. By providing the link via certain shortening services (e.g. bit.ly) you can gauge interaction with your publications. You could inform people about new government legislation, relevant publications or activities by other organisations in your research area. This could aid your own work in several ways such as by increasing your collaborative network, raising interest in your research area and perhaps leading to greater funding opportunities. Hashtags are a great way to make your area of interest, and the materials you produce more visible. You should not hold back about creating your own hashtags if no relevant ones exist, but remember what we covered on Day 6. Twitter is a great way of providing opportunities for ‘crowd sourcing’ you work, getting people to engage in and help you with your work is often possible. Some researchers have been successful in using Twitter to get actual funding. Twitter is a very good medium for helping you to reach out to non-academic audiences, such as governmental organisation, business, NGOs etc. Now you’ve learned to use Twitter as part of the #ARU10DoT community, it would be great if we can sustain the conversations and the community around social media and academia at Anglia Ruskin. 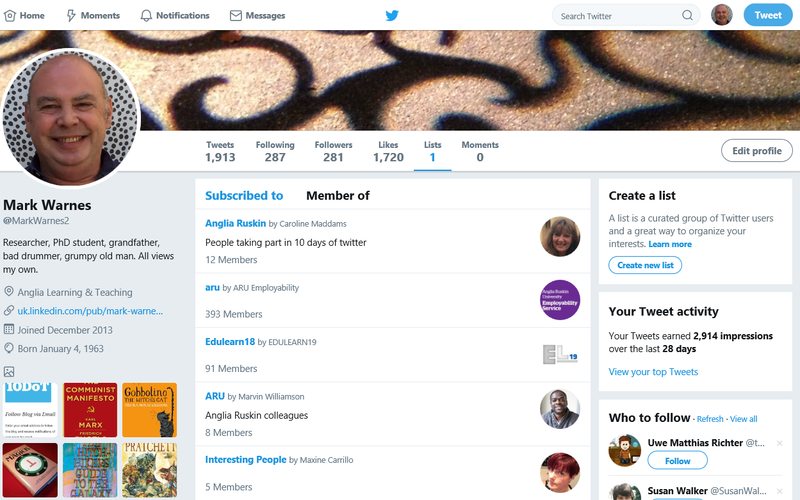 The @AngliaLTA account for Anglia Learning & Teaching draws together information and conversations around learning, teaching and assessment at Anglia Ruskin. Keep following for information about activities and events on this topic within the University and beyond. Do message us to ask questions, engage in conversations or draw our attention to anything you think we should know about! There is a hashtag, #AngliaLTA, associated with the @AngliaLTA account for tweets about learning, teaching and assessment, and we hope you’ll use it to find useful information and also to tag your own tweets for others to find. You might want to save it as a search or set up a column in your Tweetdeck or Hootsuite platform to keep track of it. I’ll still be around on Twitter as @markwarnes2 of course, tweeting about a wide range of issues to do with Higher Education. Many thanks to @dr_tobe and @mdleast for letting me adapt their text for this post. Alternatively you can click on the tweet which will open a new tab/window for that single tweet which contains the URL. You can copy and paste this URL, or save it, bookmark it, embed it in a website, or email it to people. However, this might only be a convenient way to present tweets in some circumstances. If you don’t use TweetDeck or Hootsuite, there are other apps which only schedule tweets. You might try, for example, Futuretweets or Twuffer or also Buffer (which works for other social media too). You can sign in with Twitter (or Facebook, or LinkedIn), and it will ask you for permission to access your Twitter feed. Once signed in, it will ask you what you want to share. Type in a tweet, and click ‘schedule’ or ‘buffer’. You will want to go to the ‘Schedule’ tab and set the time zone, and the day and time you want to tweet! See the Digital Badges tab at the top of the screen for more information. Activity: Today’s Digital Badge activity is to complete the Satisfaction Survey. Post a 100-word reflective summary of your experience of the course and whether it has had any impact on your practice. If you’ve experimented with Twitter and decided it’s not for you, then I hope we’ve helped you come to a better understanding of what it is, and a well informed decision on whether to use it or not. If you now want to delete your account, it’s easy to do so. We encourage you to keep your digital footprint tidy! If this is a search you might repeat regularly, click on this, and you can save the search so you don’t need to keep performing it – useful if you’re following a hashtagged discussion. You could also perform an advanced search using this icon – you can narrow down the tweets you’re looking for by word or by the person sending or receiving it, or by location. In the left hand column, Twitter will also show you what hashtags are popular at the moment. This may or may not be of much use to you! You can narrow the trends down by location, by clicking on ‘Change’ in this box, but if you are networking at a national or international level, this may not be very helpful. Moments are, according to Twitter, the best stories on Twitter. Moments are, according to Twitter, the best stories on Twitter. In essence they are headlines grouped by theme: Today | News | Sports | Entertainment | Fun. However, the Moments are a blend of trending hashtags plus sponsored content from selected ‘partners’ (including Bleacher Report, Buzzfeed, Entertainment Weekly, Fox News, Getty Images, Mashable, MLB, NASA, New York Times, Vogue and the Washington Post). So there are a range of ways to stay on top of all the information that’s being shared with you by the people you follow. Activity: Today’s Digital Badge activity is to save three searches and list them in the comments below, with a brief explanation for each. If you explored TweetDeck yesterday, you may not have realised that not only can you add columns for lists of people, you can also add columns to follow hashtags. Click on ‘Add column’, and then choose ‘Search’. If you perform a search for a hashtag, you can add a new column to your TweetDeck which will now display all the tweets using that hashtag, whether you follow the people using it or not. This might be useful if you are following a conference hashtag or chat such as #AngliaLTA but don’t want to follow all of the people tweeting with this hashtag. Pocket is an application which saves any webpage for you to look at in more detail later, when you have time. It is a bookmarking tool – if you find a webpage via a link in Twitter (or anywhere else), you can save it to Pocket, and then return to it and the other things you’ve saved later on. Pocket is a web browser based service, meaning you can access it from anywhere and any device or computer. To create an account, you’ll simply need an email address, username and password. On your desktop computer, you can download and install it into your browser, so you can simply hit a button in your toolbar to save a webpage (how to install it depends on which browser you prefer to use, but Pocket will take you through the steps – it’s easy!). When you use Twitter in a browser with Pocket installed (and also if you have installed the Pocket app on your smartphone or iPad), then a ‘Pocket’ option appears alongside the other options of ‘reply’, ‘retweet’, ‘favourite’ etc. when you hover over a tweet containing a link, so you can save it right from the tweet instead of having to open the link and add it to Pocket from there. You can also access Pocket on the web, if you’re on a computer which isn’t yours, or where you can’t install it into the browser. If you don’t have a tablet device, you can set up an account with news.me, which will deliver the main stories shared by the people you follow on Twitter in an email. To sign up, you’ll need to add your email address, and then connect it with your Twitter (or Facebook) account by clicking on the request to authorise this. That’s it! Paper.li is an application which curates content from social media streams which you use (in this case, Twitter, but also Facebook, Google+ etc.). It then presents the links it’s found in an easy to read magazine form. You can share this with others (and it will tweet automatically on your behalf, but it is not recommended that you ‘spam’ your followers in this way!) but you can just use it to pick up the links you might have missed on Twitter by adding Twitter as a source. Over the last seven days, you may have found that as you continue to use Twitter, you come across more and more interesting people to follow, and your following also grows exponentially. Keeping track of them all can be a challenge, and sometimes you will want to focus on certain groups of them over others, or check in on some people only sporadically. This is hard to do in the undifferentiated stream of tweets on your Twitter feed, where they are all mixed in together. 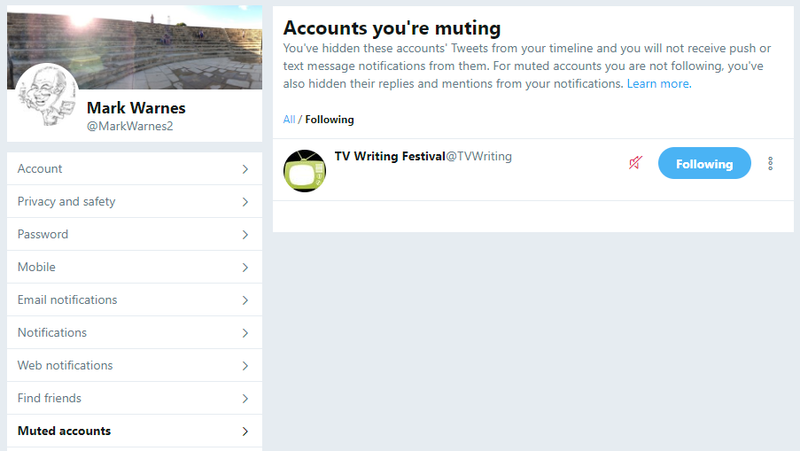 Fortunately, there are ways to split up your Twitter stream and group the people you follow into separate groups, so you can keep an eye on their tweets as it suits you. Twitter has a feature which allows you to make lists of people – and you need not follow all of them to add them to a list. These lists can be private, so only you can see them, or they might be public so you can share them with others. I created such a list for the participants of this course on Day Two, so you could find each other on Day Three. You might create such a list for the benefit of others, for example, to bring together the attendees at a workshop or conference, students on a particular programme or module, or the top accounts on a particular topic which you recommend other people should follow. You can share a list by giving people the URL of the list page, or let them view the lists you’ve created on your profile, where they can subscribe to your lists too. Click on ‘Create list’, and you will be asked to name your new list and add a brief description. This description will be very helpful if you now choose to make the list public, so others can find and subscribe to it. You will now be invited to search for people to add to your list. You can also add people later, by clicking on their @name and going to their profile. Clicking on the vertical ellipsis (‘More user actions’) opens a menu containing the option ‘add or remove from lists’. To view your lists, or those of other people, you can simply go to ‘lists’ on your ‘Me’ tab (one of the options across the top), and see only the tweets from the people in the list. While we’re on the topic of managing people, you can also block people, for example, if you are followed by a spam account or someone you don’t want following you. My Block List (accessed through Settings and Privacy) includes a variety of unwanted or undesirable accounts. As I’m not a fan of gambling, for example, I have blocked Bet365, 888Poker and Newmarket Racecourse. Some are musicians or authors who are trying to sell their products (if they were any good they wouldn’t need to stoop to this). Some of the accounts appear to be Twitter bots as it is highly unlikely that young girls who live in the US and don’t speak English are a) real and/or b) interested in anything I have to say! Others I block for political reasons. I have not actively sought out accounts to block – these are all accounts that followed me for reasons best known to themselves. 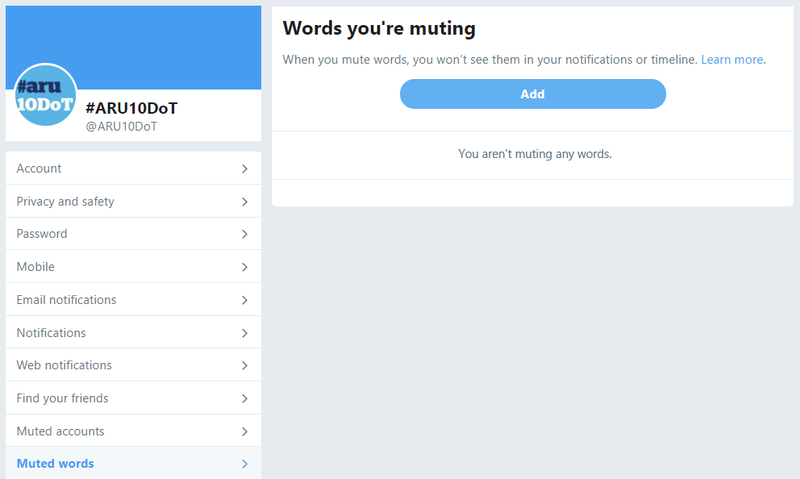 In addition to muting people, you can mute tweets containing specific Words that are associated with content you would prefer to avoid (like ‘Brexit’ for example). Activity: Today’s Digital Badge activity is to create a list and post the link as a comment on this page (e.g. https://twitter.com/MarkWarnes2/lists/famous-people). You might want to try making a list of your colleagues on Twitter, or perhaps one for the professional and funding bodies you follow. The beauty of Twitter is in its simplicity as a platform. However, sometimes you need a bit more functionality. There are some third party applications created by other companies as add-ons to Twitter, to help you out with some of the things about Twitter which you may find a bit overwhelming. Some of them will need to be integrated with your Twitter account to drawn information from them, and to do this, you will need to grant them access to your account (you can undo this again from your Twitter account settings). You might want a more convenient way to view different aspects of your Twitter stream, or even add in updates from other platforms such as Facebook or LinkedIn together with Twitter, so your whole social media stream is visible in one place. To do this, you can use one of the third party applications that were developed to make Twitter easier to use. Tweetdeck is owned by Twitter, and is a good way to manage more than one account, if you have more than one (for personal and professional use, or perhaps an individual one and an official one on behalf of an institution). 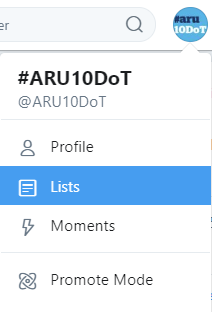 I am using Tweetdeck to tweet from @ARU10DoT, @markwarnes2 and also @AngliaLTA at the moment, without having to log out of one account and into another – and it’s easy to get confused and tweet from the wrong one! However, you can also use Tweetdeck to split your Twitter stream into columns divided by people. 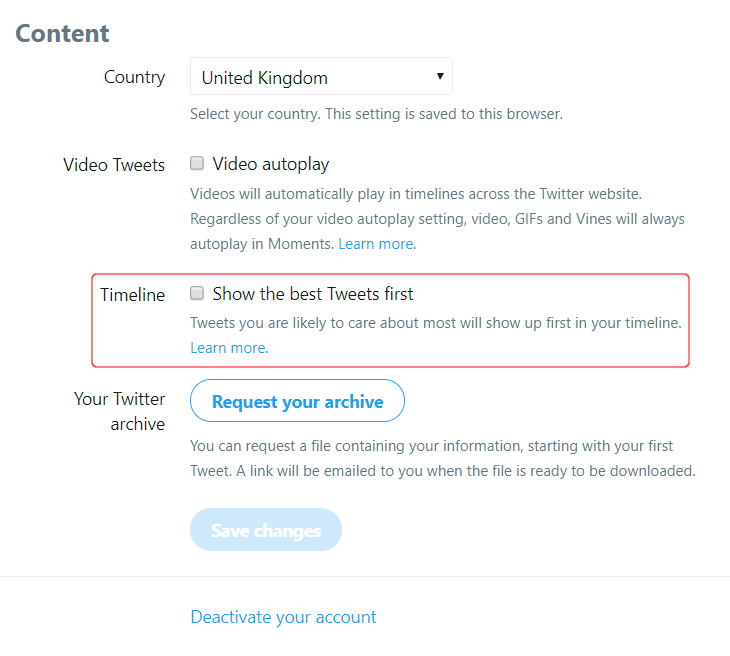 It will import any lists you have made on Twitter too. You will need to create an account, with an email address and password. Once you have set up an account, you can connect your Twitter account(s). You can use it as a web-based application to access from anywhere, or you can download the Tweetdeck app to your computer (there is no app for smartphones or tablets). Tweetdeck is organised into a number of columns, and gives you a number of columns automatically, such as your timeline, your own tweets or your @mentions (tweets that mention you), and you can add new columns for the lists you create. You can also create new lists in Tweetdeck. Click on ‘add column’, and choose ‘lists’ (or any other column you want to add!). You can do everything we’ve covered in Twitter on Tweetdeck too, including shortening URLs. Tweetdeck also makes some other things in Twitter a little bit easier. For example, when you retweet, it will ask you if you simply want to retweet or if you want to edit the tweet, as we discussed in Day 6. 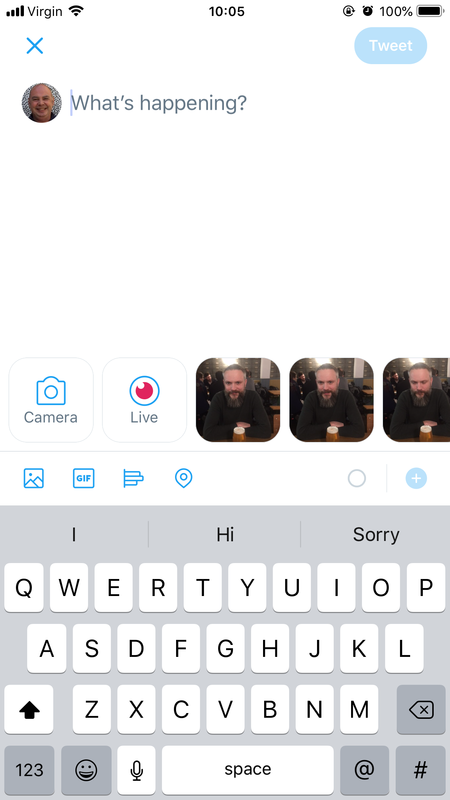 On Twitter, you need to copy and paste the tweet if you want to edit it, which can be fiddly; this does it automatically. Keeping track of who has completed the daily tasks is a tricky business! Please let me know if you think I’ve missed anything, please send a screenshot of anything I’ve missed showing where you posted it – I’ll just claim a senior moment! Don’t worry if you still need to fill in the table, though – there’s plenty of time to catch up! The Twitter app is available for both iOS and Android devices and once you’ve installed it simply tap to create a tweet in the usual way. 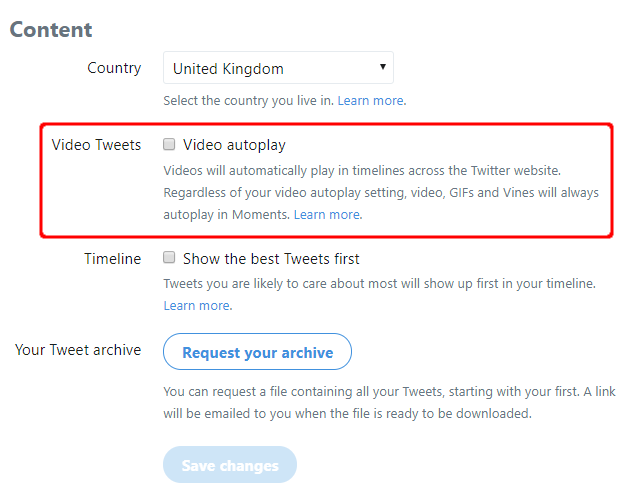 You can choose to select a picture or video from your library, but you will need to give Twitter permission to access your pictures. 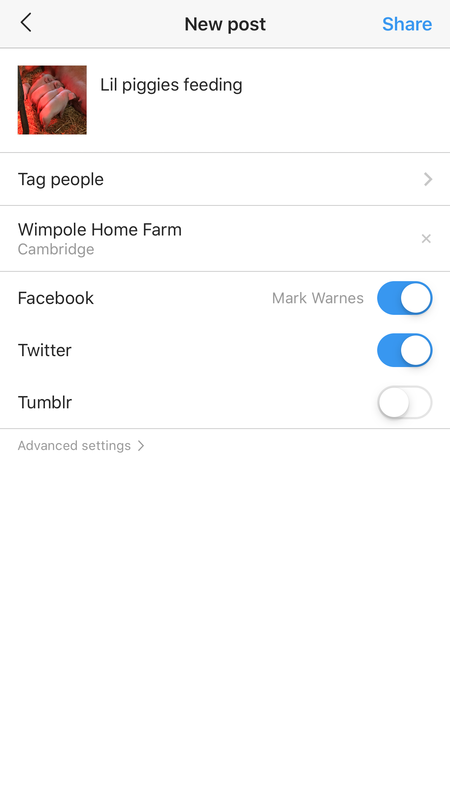 Alternatively you can choose to take a new picture or record a video from inside the app. To do this, simply tap on the blue Camera icon. Alternatively you can opt to tweet Live video, using the ‘Live’ button. However, you will need to give the app permission to access your camera and, if you want to record video, your microphone as well. Once you have added your chosen media, add a comment in the ‘What’s happening’ box and tweet. Simply click on the Media button, browse to your picture, and pick the one you want to share. In addition to photos and videos, you can also add a GIF (a short animation), or include a simple Poll. You can also allow Twitter know your Location.